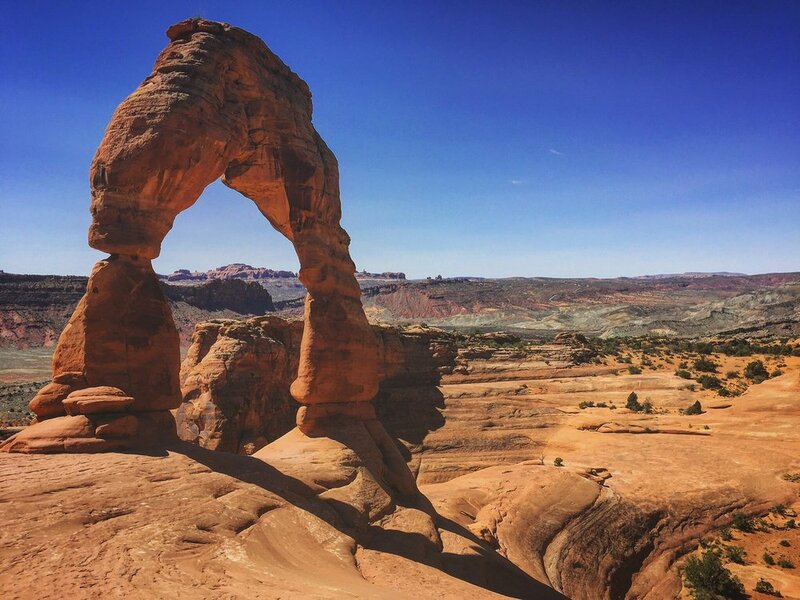 Visiting Arches National Park in a weekend. A guide to visiting Banff National Park in a weekend. Every trip I take, I like to pre-plan. Some people (my fiancee) would say that is way too intense, but with weekend trips, every minute counts :). So, I've decided to post my itineraries on here to hopefully inspire people in their planning process. 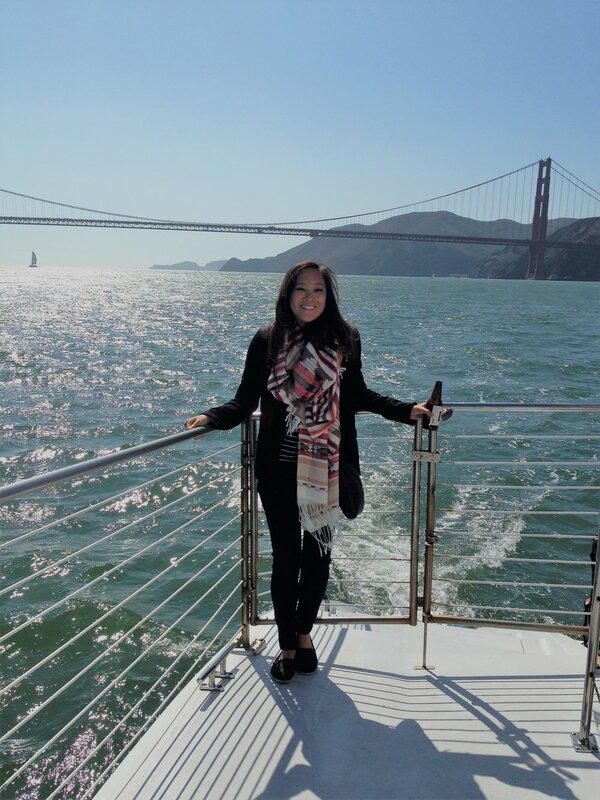 My first post will reflect on a San Francisco trip I took with a friend over Memorial Weekend in 2015 - which is more than a 3 day trip but still a weekend trip! When we went to San Francisco, we stayed at our friends' houses which helped save us a lot of money - as hotels in SF can get pretty pricey. I'd suggest trying to find a place to stay in Union Square, as it is pretty central. 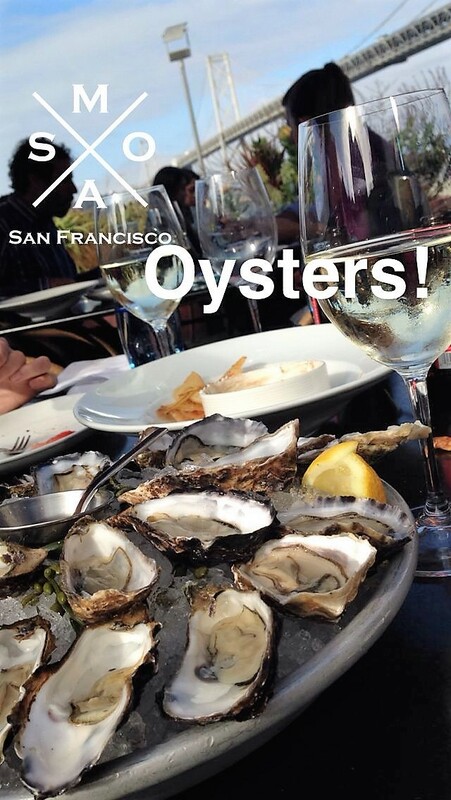 We started our weekend off with some happy hour oysters near the Embarcadero at a popular restaurant called Waterbar. They are typically a bit expensive, but have a great happy hour with $1.05 oysters on weekdays from 11:30am - 5pm. We had to wait for a little bit, but ended up getting a perfect table outside. If you don't want to wait for a seat, you can try your luck in the Ferry building at Hog Island Oyster Co, or any of the many oyster places in SF. Most people marvel over the Golden Gate Bridge, but the Oakland bridge isn't actually too bad! After we stopped at the Water Bar for some oysters and wine, we took an uber to Coit Tower and Telegraph Hill to walk up many stairs to see the tower. It was nighttime by the time we got there, but we still got some great views of the city. From Coit Tower, we walked our way down to Chinatown, where we contemplated eating but ultimately did not. There are some great choices out there though! We did grab dim sum later on in the trip. Saturday was a busy day, so we got up early and got coffee and breakfast somewhere that I can no longer remember, but there are definitely great choices out there on Yelp! Coffee though - plenty of great options. We ubered from our friends house to the Painted Ladies, as made popular by Full House. There's a nice lawn area to hang out and have a picnic at to look at these houses and a view of San Francisco. We had pretty cloudy weather, so the colors weren't as vibrant. From the Painted Ladies, we took yet another uber (or Lyft) to Golden Gate Park where we chose to visit the Japanese Tea Garden for some tea and snacks. I wish we had more time to explore the park, but we were running low on time. We had booked a bay sail departing from the Fisherman's Wharf with Adventure Cat. Little did we know that traffic is crazy in SF and so we ended up getting out of the car early and running to the gate. We ran through hoards of traffic and made it to a closed gate where the boat was boarding. Thankfully, a kind lady next to us with a loud voice was able to get the attention of the company who let us board. After a few moments of catching our breath, we settled into the boat, grabbed some beers and enjoyed the views. It was windy and chilly so if you go - bring a jacket. After our bay sail, we stopped by Fisherman's Wharf, and Buena Vista Social Club. I have no photos so, will continue on to our drive up to Santa Rosa, where we stayed at our friend's parents house. 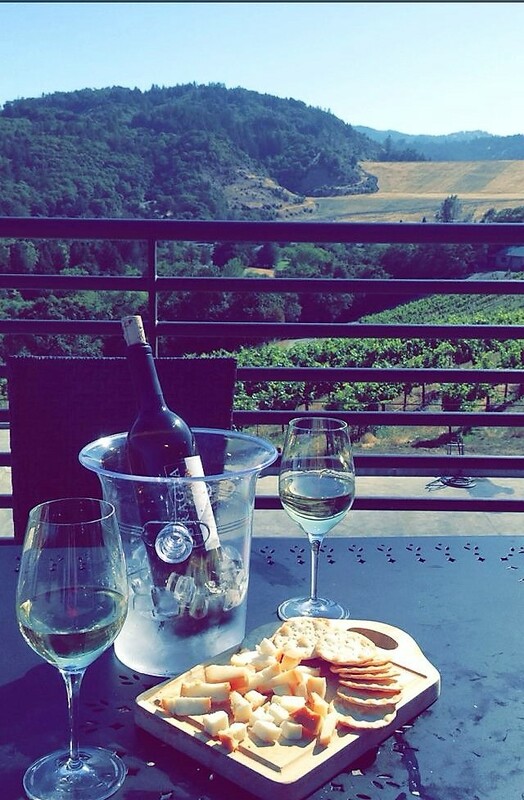 We rented a one day car rental and drove up to meet our friends at a winery. The next day we stopped by Korbel for some champagne tasting and food before leaving for the redwoods at Armstrong Redwoods State Natural Park (though I put Muir Woods on the itinerary because it's bigger and more popular). 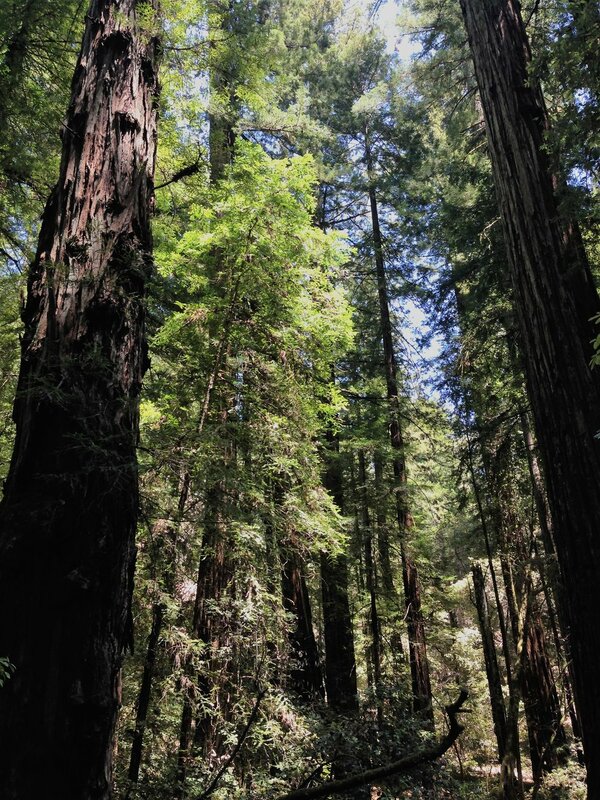 Redwoods are amazing to see in person! 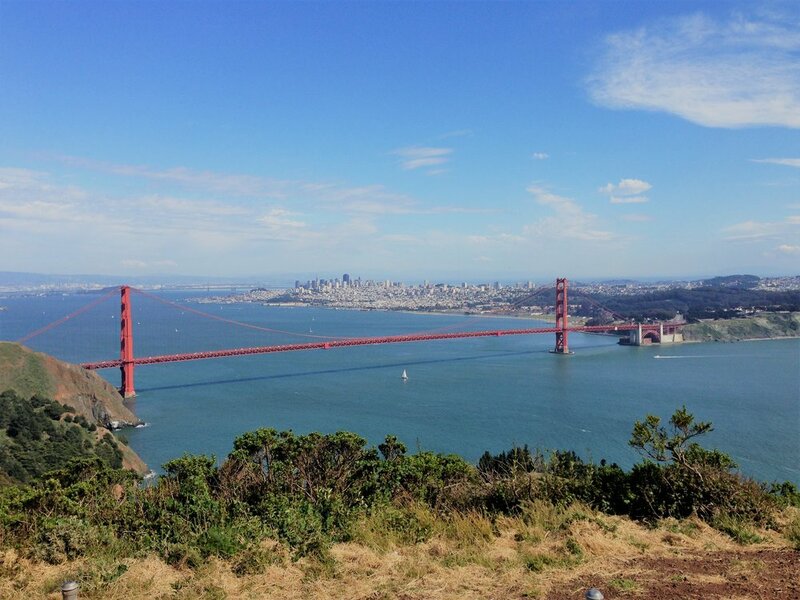 And that was our fun trip to San Francisco! Los Angeles is a massive city. A whole summer spent here would not be enough time to explore the entirety of its eccentricity, history, food, and fun. However, not all of us have the time (or money) to explore LA beyond just a weekend. So how does one see LA in a weekend in the most time-efficient and cost-efficient way? Well, make sure you have a lot of coffee! Arrive in LA. Most people will arrive at Los Angeles International Airport, which is not immediately surrounded by many activities or fun things to do. Hotels near LAX will be the best quality for a low price, but there aren’t many things to do around there. Unfortunately public transportation from the airport isn't the best, so I suggest renting a car. If you don't have one, I'd suggest downloading Uber or Lyft and go from there. Downtown Los Angeles - these are reasonably priced, but nice hotels in DTLA, ranging from about $150-$200 a night generally. I'm partial to downtown, as my friends reside there, and I used to work at the LA Superior Court and Federal District Court downtown. However, I have to say that downtown is a good spot to stay when visiting LA, as it is walkable and there's great food options in the area. Downtown - rooftop bars are quite popular downtown. Grab dinner at Bestia or Church and State in the Arts District. Grab a drink afterwards at Everson Royce. Then head to one of the popular rooftop bars for a final drink before bed at either The Ace Hotel, The Standard Hotel, or Perch. Or, skip the rooftops and head to The Edison, one of my personal favorite spots. Santa Monica - For a simple dinner, head to Umami Burger - their truffle fries are delicious. If you want a nicer, sit-down burger, head to Father's Office. If not feeling burgers, The Misfit Restaurant has several options (and is good for a late night meal), or Tar & Roses has many good choices as well. For drinks and dancing, Ma'Kai has good music, despite being a sushi restaurant! Wake up, its time for brunch! Head to Venice Beach. On Saturdays, traffic isn't as bad on the highways, so it shouldn't take too long to drive to Venice Beach. Once you arrive, grab brunch at either 26 Beach or French Market Cafe. Fill up on coffee. Once breakfast/brunch is finished, head over to the Venice Canals. After you see these beautiful canals, wishing you could live in one of these fancy homes, head over to Venice Beach, where you can alternatively eat breakfast instead at one of the street shops. Either sit on the beautiful and expansive beach, or look at all of the strange shops. Buy some weird souvenirs, or see a marijuana doctor. Look at the people working out at Muscle Beach or watch skateboarders do their thing. Drive to the Getty. Venice to either of the Getty’s is about a 15-20 minute drive. The Getty VIlla features art and history of Greece and Rome. The Getty Center displays art and architecture from modern times to special exhibits. To go to the Getty Villa, you must reserve tickets in advance. They’re free, but parking is $15. It is limited access to the Getty Villa. You do not need to reserve tickets in advance to go to the Getty Center. I personally suggest the Getty Center over the Getty Villa, because it is larger and there is more to see and do. However, both are absolutely beautiful and a must do! Go to Rodeo Drive. Rodeo Drive is known for its shopping. From the Getty, it should be about 15 minutes. If you want to window shop, or buy an extremely expensive souvenir, definitely stop by Rodeo. You will have an easier time finding parking near El Camino, in between Rodeo and Beverly. Beverly Drive also has several good eats, if you’re hungry by this point. Check out Urth Cafe on Beverly or if you feel like spending money and potentially just maybe seeing a celebrity, stop by Spago. Head up to Hollywood. Hollywood should again be another 15 minutes (perfect, I know). I personally find Hollywood to be extremely crowded and boring, but I’ve been there several times. I suppose its worth walking down just to see. Hollywood is actually pretty big, but the big touristy spots, such as the Chinese Theater and Ripley’s Believe it or Not is on Hollywood Blvd, in between La Brea and Highland Ave. Parking can be found on a side street, but don’t try and find anywhere on Hollywood. It’s pretty crazy. P.S. The Disney’s Soda Fountain shop has amazing milkshakes. Dinner and Drinks. After walking around Hollywood Blvd. for a little bit and being touristy, grab dinner at Roscoes Chicken and Waffles for some delicious chicken, Velvet Margarita for some Mexican food and fun drinks, or Bossa Nova for Brazilian food. If it's early enough, you should stop by No Vacancy, a speakeasy that can get pretty crowded later in the evening, but has burlesque shows that are fun to watch if you get in! Griffith Observatory. The Griffith Observatory is a building with exhibits related to astronomy, which are actually quite interesting! But the views from the observatory are what brings in the people. Check out the city from above by taking Los Feliz, and turning on Fern Dell Drive. This is also a great place to see the Hollywood sign. Grab some brunch within walking distance from your hotel at Bottega Louie, if early enough. They don't take reservations, but the food, service and macarons are excellent. If you want to stay more low key, head to LA Grand Central Market - where there's a variety of foods to try - including the famous EggSlut. If you choose to eat at the Grand Central Market, take a few moments to explore Angels Flight across the street. It's closed, but you can walk up the stairs for a nice view of downtown. Head to LACMA. The LACMA stands for the Los Angeles County Museum of Art. It contains many great art exhibits, but what most people come here for are the lights outside of the museum itself. Head to Santa Monica. If you still have some time left before your flight out, stop by Santa Monica 3rd Street Promenade and park your car in one of the parking structures, as you probably won't find parking on the street. From there, you can easily walk to the pier or lay by the beach before you have to take your flight home. YES this can all be done in one day, because I have done it! But, I suggest splitting up days so you don’t need a vacation from your vacation. It may be difficult, depending on the times you are driving and the time of year you visit. 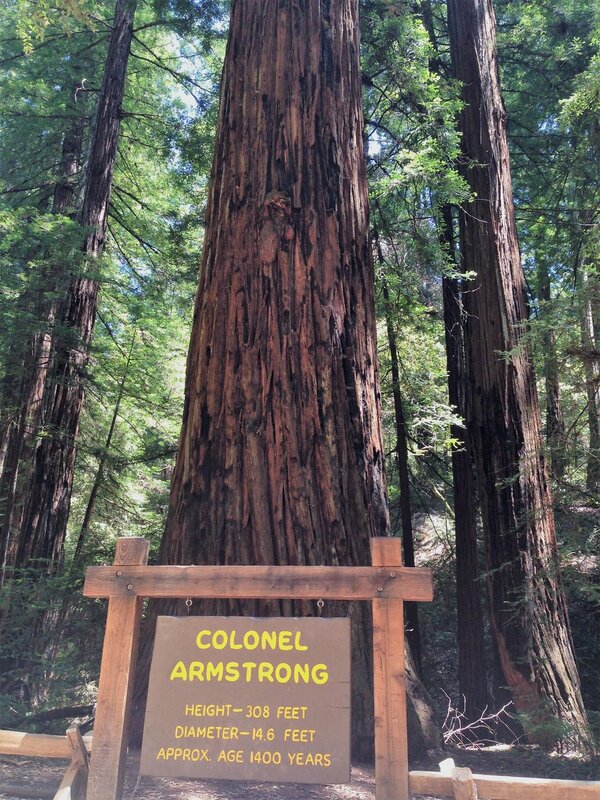 After this visit, you’ll definitely want to explore more, and there is much more to see! For those who would rather not read my rambling posts, here’s a quick snippet of what to see, do, eat, and plan in Belize! Southwest Airlines offers one flight a day direct from Houston to Belize City for a reasonable price. (+ 2 free bags!) It lands in the afternoon. Car Rental – I read that car rentals are readily available, but the roads are not in the best condition and have lack of signage. If driving through Belize, be sure to drive during the day, as there are very few street lights as well. There are no stop lights, except, I believe one. Flying in Belize – Tropic Air and Maya Air fly around Belize. Sometimes it’s cheaper to fly rather than drive and obviously faster. TIP: If your destination is to San Ignacio, the flight lands at Maya Flats, which will require a drive to town. If you do not have pre-arranged transportation, you may have difficulty finding a way to San Ignacio. TIP: Taco Girl’s Blog has a discount to Tropic Air flights, about 5% off. Check it out! TIP: Tropic Air’s flights are non-refundable, non-Pupuseria Salvadoreno and non-transferable. Double check your dates and times before booking. Transfer – there are many transfer services to San Ignacio. On average, it’ll cost you about $60USD – $80 USD, depending on the amount of people you’re with. Water Taxi – water taxis to and from San Pedro and Ambergis Caye to Belize City are fast and reliable. You can purchase a ticket the same day for about $15 one way. The travel time from Belize City to San Pedro on water taxi is about 1.5 hours. Golf Carts – in San Pedro the fastest means of transportation is a golf cart. They aren’t the cheapest, but if you can find a standalone golf cart rental store, you can save a few $$. Taxi – taxis around San Pedro are generally a set fee + tip. Taxis in Belize City should be negotiated before taking off. TIP: Give yourself plenty of time to head to the airport from Belize City. There is only road to the airport, and it can get congested. It takes about 30 minutes without traffic. Belize City – Belize City doesn’t have too much to do, but if you need to stay, there are not many airbnbs or hotels. Radisson Fort George Hotel – probably the best hotel to stay at in actual Belize City, near the water taxis and the cruise port. San Ignacio – many options in/close to town, and a few a little bit further from town. Determine whether or not you want to have the ability to walk to town for food and explorations. Midas Hotel – a cheaper, budget hotel with options of stand-alone bungalows with private bathrooms or regular rooms with shared bathrooms. Walking distance to town, with a bar and nice pool. (about $50-$100 a night. San Pedro – hotels and vacation rentals vary in price, but range from $100-$400 a night. Most places are accessible via golf cart or taxi. Ramon’s Village – we almost booked this resort. It is extremely close to town and right across from the San Pedro airport. Convenient for exploring town. Cave Tubing – if you are interested in Mayan history, this is a relaxing way to learn about the Mayan underworld by seeing it firsthand. This does involve a small trek to the entrance of the cave and paddling around. I highly recommend doing this! TIP: Add cave tubing to a transfer from the Belize City airport if you arrive in time. This cuts down the price of the transfer and saves some time, as the cave tubing is on the way from Belize City to San Ignacio. I used Go Maya Belize. ATM Tours – ATM stands for Actun Tunichil Muknal. This is an a more extreme version of cave tubing, involving crawling through tight spaces and trekking through water. I’d suggest doing this if you have more time and want an even more first-hand experience. Zip-lining – an easy add on to the cave tour or ATM, the ziplines span across the jungle and the river, which is a unique view and is fun and refreshing. Mayan Ruins – Xunantunich and Altun Ha – both doable without a tour, but if you want to learn more about the Mayan history, I recommend a tour. Beautiful views from the top of Xunantunich, and a great place to see ruins that you can touch and are mostly still in tact! Snorkeling Tour – definitely take the time to go out in the water to see Hol Chi Man and Shark Ray Alley. Many places offer this quick trip for about $30-$50. Scuba Diving – Belize is known for the Blue Hole. If you are a diver, don’t miss out on this opportunity to see one of the most beautiful natural sites. Museum of Belize is a 2 level museum with a lot of history about Belize. Before I got to Belize, I obsessively checked the weather and noted it was to rain everyday, despite the fact that the rainy season had just ended in November. The locals told me to disregard the weather, as storms come and go quickly on the islands and in Belize. Unfortunately for us, it rained the entire three days we were in San Pedro – but we made the best of it! We landed in San Pedro in the afternoon and a driver from our hotel was there waiting for us patiently. It was the one sunny time of the day, and I was excited for some beach time! The island is mostly full of golf carts and bicycles with the occasional cars here and there. I used my Chase points to book us a room at the Victoria House. The Victoria House is near the southern portion of the San Pedro island, and is absolutely beautiful. They provide a free pickup and dropoff to the airport and free breakfast. The hotel is very modern, with several pools and lounging areas. Upon arriving we were handed a welcome drink and were lead to our room, which was beautifully decorated. The bathroom was spacious and our room had a mosquito net around the bed. We took some time to rest up before heading to town. Unfortunately all the golf carts were rented at the Victoria House by the time we went to dinner, so we got in a taxi to eat at a delicious Salvadorian place called Pupuseria Salvadoreno. They are known for their lobster burritos – which me and my boyfriend split while watching a holiday parade walk by. Drinks at the Victoria House were pretty pricey so we picked up a bottle of Nance (a local Belizean liqueur made of Craboo – a Belizean fruit) to drink on our own. The Nance was so sweet, and while I’m glad we tried it, I’ll probably never want to drink it again.. worth a try at a restaurant, but don’t buy a whole bottle like we did!! We were running low on cash, so we decided to walk back to the Victoria House from town. This took about 30 minutes and gave us a good idea of what was around us, but we were eaten alive again by mosquitoes. At the end of our walk, we ran back to the hotel to try and escape the mosquitoes! At night, I couldn’t help but feel they were all over me again. The next morning we woke up and had breakfast at the Victoria House. The free portion includes breads, jam, and fruit. We paid a little extra for an omelette. While the Victoria House is definitely luxurious, it is also quite pricey. A golf cart rental there was about $20-$30 USD more than other places, so we walked a little further down and rented one from another store. Snorkeling tours were also pretty pricey at $60 a person. We headed to town in hopes of finding a better rate. And a better rate we did find! As soon as we walked off our golf cart, we were asked if we wanted to go on a snorkeling tour. It was as if we had it written on our faces. We ended up paying $35 USD each for a boat ride out to the Hol Chan Marine Reserve and Shark Ray Alley with Amigos Del Mar. We got to get out of the boat and snorkel with the fishes and sealife and the sharks! This is an experience I would not pass up. There are plenty of places to book a snorkeling tour, so don’t feel the need to book beforehand. Depending on what you want (food + drinks and a private tour, or a public simple snorkel tour), you can get prices from $30-$100 for a trip out there. The $35 tour took us out on a simple boat, provided snorkeling gear, paid for entrance to the marine reserve and allowed us to snorkel for about 2 hours. Afterwards, we headed back to freshen up before grabbing dinner at The Hidden Treasure Restaurant, which was a 5 minute walk from our hotel, but, as it was raining, they arranged for a taxi pick up. Eating here was quite an experience – the waiter was one of the friendliest waiter I’ve met, and we ate a delicious meal. I would definitely eat here again, and highly recommend it! The next morning I had planned to lay out by the pool and rest, but unfortunately it was pouring rain again. We took a water taxi back to Belize City (Ocean Ferry) which only cost us $17 each. The ferry was extremely fast, we got to Belize City in less than 1.5 hours. Once we got to Belize City, we visited the Museum of Belize. I think we were the only visitors! Belize City had a different feel to it.. we were hounded by people asking us if we needed a taxi, and we told them not until later. Well, they remembered later when we came back, which was interesting! A few people asked my boyfriend if he wanted weed too haha. The Museum was extremely educational and kept us dry from the impending rain. I’m not sure if it was the rain or the construction, or both, but our taxi from Belize City to the Belize International Airport took over an hour. I was freaking out that we would miss the only flight back to the US that day remaining.. but we made it just in time for boarding! And just like that our trip to Belize was over! After finishing our cave tubing tour, exhausted, we checked into our hotel, the Midas Resort. The room was a standalone building, which was a little worn, but for $70 a night, it was not bad. San Ignacio was a 10 minute walk away, and felt completely safe at night. At this point, we had only been in Belize for 2 days, but so much more was left to be seen! We chose to eat at Ko-Ox Han Nah for dinner with the intention of eating at another place afterwards to get a taste of multiple places. While inland, it is advised to eat land meat, obviously, and while on the islands, eat the seafood. I got the coconut rice, stew beans and chicken and my boyfriend got the same with pork. There are different variations of the rice + beans, as some are mixed and some are not. If you are in San Ignacio, go with the coconut rice – which is simmered in coconut milk. Each plate was about $10 but extremely filling! We ended up going back to our hotel and hanging out at the hotel bar to use the wifi and relax instead of gorging ourselves with more food. The next morning we had breakfast at Pops. I suggest trying their Flat Jacks – they are delicious doughy bread. I originally planned on exploring San Ignacio and Xunantunich on our own, as the tour was an extra $80 a person. However, after learning so much from Onil the day before, we added on the tour to Xunantunich. You can get there easily on your own by taking a taxi or a local bus. It’s about a five-ten minute drive away. The entry point is a ferry across the river, and from there you can pay the entrance fee to Xunantunich and walk around. Xunantunich is one of the largest Mayan sites remaining in tact within Belize. Like the cave tubing tour, I was amazed at how open everything was here. There were artifacts with no glass protection – yet none of it was grafittied, stolen, or ruined by humans. This site has gained recently popularity due to a discovery of a buried royal warrior, with much of the tomb still in tact. Apparently he had died pretty young, and was tall for the time period. That specific site was being excavated, so we couldn’t see more, but there was plenty more to learn. Going with a guide was a great idea at the end of the day because there was little to no signage at the site to explain the structures. However, there is a museum at the entrance that does give some educational background. After Xunantunich, Onil took us to a Mayan lunch spot nearby (Benny’s Kitchen). I ordered the chicken, rice and beans again, because it was just too delicious. There were many Mayan dishes with other meats, but as I only eat chicken and fish, I couldn’t taste them. The restaurant was extremely busy, but they accommodated us quickly. Onil then took us to Maya Flats, the San Ignacio airport for our next flight to San Pedro. It turns out we were the only ones on the flight – so we got our own private jet flight across Belize. It was an amazing experience! For my very first blog post, I have decided to write about my most recent vacation to Belize. In 2012 I visited my friend in Washington D.C. where they were happening to be having an Around the World Embassy Tour in which several embassies opened their door to the general public. We didn’t have time to see many, but one embassy we visited was Belize. 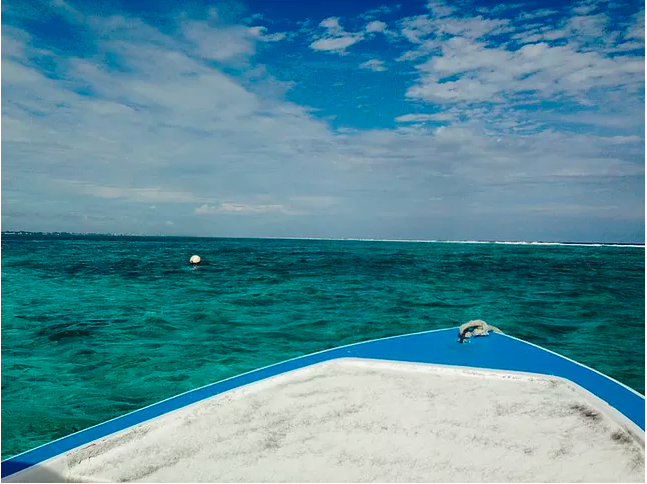 Upon seeing the images of the blue water, trying some of their foods and drinks, and talking to the Belizean people there, I was convinced that Belize was the ultimate dream destination. Fast forward four years, and I found myself with the opportunity to fly to Belize for free using my Southwest miles. Every flight I had searched for in the past was about $500-$600 round trip from San Diego. With Southwest, it was about 10,000 points one way with $60 in taxes (Belize taxes which all visitors must pay upon leaving the country). I happened to be embarking on this trip with my boyfriend, so I added in a quick stop to Cancun for an all-inclusive resort, which I used with my Amex miles. I made the mistake of booking our flight from Cancun to Belize one day too late – which ended up being quite costly. Tropic Air is one of the only airlines that flies within and around Belize, but their booking system didn’t have much information on changes or cancellation policies. I had purchased a one-way flight from Cancun to Belize City for $150. Well, if you ever find yourself in a situation like me – Tropic Air’s flights are non-refundable/non-changeable & non-transferable. I ended up having to buy a new flight – so to avoid a costly mistake like this – double check your dates before buying! I was surprised to find out that Tropic Air’s planes are more jets, and they are tiny! I’ve been on small aircrafts before, but this was another level. There are obviously no bathrooms – so use the bathroom before you leave! The flight from Cancun to Belize City was about 1.5 hours. The flight was seamless and the views were unbelievable. Blue waters and tiny islands! We landed seamlessly into Belize City at Philip S.W. Goldson International Airport. The airport was like the Tropic Air flight – tiny. We waited maybe five minutes to get through immigration and customs (no Global Entry here!) and walked right out into Belize, where our shuttle driver from our hotel was waiting for us patiently. We decided not to stay in Belize City, as I had read that it wasn’t the safest, and there wasn’t much to do. Instead, we stayed at the Black Orchid Resort. This saved us the cost of having to pay for a taxi, as the shuttle ride was free. The Resort is only a few miles away from the airport, but because there are really only two main roads in Belize – the North Road and the South Road, everything takes a little bit longer to get around. When we arrived at the Black Orchid Resort, we checked into our room, which had a pool and river view. It was pretty humid that day, so we wanted to dip in their pool, but they were having a holiday party right at the pool area, so we opted to walk into town instead. The closest town to the resort was Burrell Boom. There aren’t really any signs or any indication as to where you are going but thankfully Google maps lead us to town. I’m Asian and my boyfriend is Caucasian. Needless to say, we stood out as we walked into the small village as school was letting out. We walked past kids playing outside and dogs off the leash. In search for a place to eat, we found a local convenience store, but we were surprised to find out the employee at the store did not understand what we were saying. While English is listed as the main language in Belize, the majority of people there actually speak Creole – which is a mix of the English and African language. We left the store and continued walking around the village – which was primarily houses and schools. We eventually came across a Coca- Cola sign and went in. Finally we had come across food! While Belize is known for it’s rice and beans, Chinese food is actually quite popular there too! Belize has a large population of Chinese people due to forced labor in the late 1800’s. Most convenience stores are owned by Chinese people, and Chinese food is the only “fast food” that Belize really has. After we filled up on fried rice and fried chicken, we went back to the resort, where the holiday party was going down. We felt confined to our room due to the party, but we were able to wind down from our Cancun trip at that time. We chose to eat dinner at the resort (because there were no other options), and unfortunately, the food was average and the prices were high. I’d recommend picking up some food in town to stock up for later. The Black Orchid Resort provided us with free breakfast, and the next day we were on our way to San Ignacio. Transfers in Belize are very expensive. As I said earlier, it takes forever to get anywhere, so to get from Belize City to San Ignacio, it would take about 2-2.5 hours and would cost you about $100 a person. Based on this knowledge, I decided to throw in a cave-tubing and zip-lining tour with our transfer. This ended up being $142 for the cave tour, zip-line tour, and the transfer. I used Go Maya Belize – which was amazing! The day we went cave tubing there was almost no one there. I was told that this was because it was a non-cruise ship day. If you go to Belize, look up cruise ship times so you do not get bombarded with cruisers on your tour. Our guide Onil gave us so much information about the caves, Belize, and Mayans. We were also the only ones ziplining, which made the whole process extremely fast and fun! After ziplining, it began to rain. We walked through the jungle to the entrance of the cave. The walk was about 30 minutes carrying the tube that we floated in. We were eaten alive by mosquitoes. Word to the wise: BRING BUG SPRAY!! I cannot stress this enough. Even bug spray didn’t work all the time, but it helped. Upon entering the cave in our tubes, we floated along as we listened to Onil explain how the Mayans believed that the caves were considered the Underworld, how sacrifices were made, and Mayan traditions. We even got out of our caves and crawled through low crevices to find broken pieces of pots where sacrifices were made in the past. It was amazing to me how such ancient artifacts were able for us to touch and that they were still so in tact – and not stolen! The caves were pitch black. You can’t see a thing, but you can hear the bats. I would not suggest it for those afraid of the dark, tight areas, or of bats and small creatures such as spiders. After exploring the caves for about four hours, we finally reached the end and jumped back in the car where we set off to San Ignacio!